incorporated by the laws of the state of Michigan. Quality Plus Driver Training believes that driver training programs should promote safe and defensive driving techniques. Our instruction emphasizes traffic rules and regulations and provides information about how the driving task is affected by drugs and alcohol. The highway transportation system grows more complex and dangerous every day. New drivers need to be taught modern techniques that teach safe driving habits and attitudes, perception, and space and time management. Offers driver training classes in accordance with state laws and operates under the authority of the Michigan Department of State and the State Board of Education. Our instructors are state licensed and driving records are on file for public inspection by appointment. Each instructor receives regular training to stay current with changes in state law. Serving Teens and Adult drivers in the Michigan's Graduated Licensing & Third Party Testing Program. We currently operate the driver training programs for Waldron Area Schools, Union City Schools, Camden-Frontier Schools and are under consideration for several other school systems. You are welcome to attend any of our classes at any time, without prior arrangements. Segment I classes must be a full 24 hours of classroom instruction, as prescribed by state law following a printed lesson plan available for your inspection, and 6 hours of behind-the-wheel instruction. Segment I lesson plans should address the performance objectives as outlined by state law and the department of education. Segment II must consist of 6 hours of classroom instruction that will examine the students driving experiences and provide information to prepare them for their use of the Level 2 driving license. Class size should be limited to 36 students by state law but, ideally, should be under 30 students. 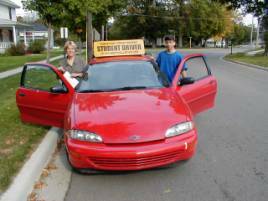 Driver education vehicles should be late-model cars equipped with dual brakes and identified by large student driver signs. Textbooks should be current and in good condition. Each student should receive a copy of the state driver's handbook. Instructors should keep records of each student's progress both in the classroom and on the road. The instructor should be able to accommodate those who have different learning styles. Classes should be open for inspection and attendance by parents/guardians. Instructors should be experienced and should be receiving regular workshop training to stay abreast of current laws and teaching and driving techniques. Call or write for current class offerings in your area. New classes forming every month in every location. All Original pages are a concept, design and creation of Ed Geishert Jr. and Marianne Hasselt. All original graphics copyright of WebWorkOne.